They say a rising tide lifts all boats, but what about a rising data set? The Alaska Longline Fishermen’s Association is nearing completion of a bathymetric map to help local fishermen catch more efficiently. The map was made possible through a network of small boat fishermen that have spent the past decade gathering data on the bottom of the sea floor. ALFA is hosting the Sitka Sablefish Summit today (03-07-18) in room 229 at the University of Alaska Southeast. There will be presentation on the status of the sablefish stock in state and federal waters, as well as updates on the Southeast Alaska Sperm Whale Avoidance project. Stephen Rhoads was exploring the open ocean with the click of a mouse. “This is a great image of how good our data is getting,” he told a group of fellow fishermen. 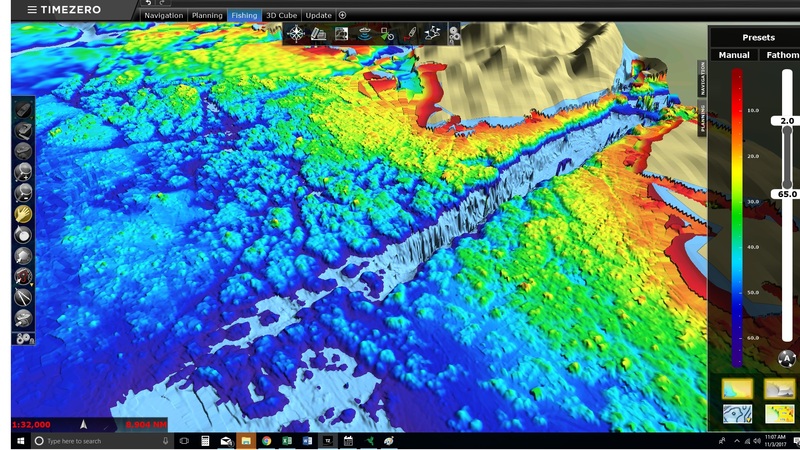 During a workshop yesterday afternoon (03-06-18),Rhoads demonstrated the latest version of a bathymetric map that details the rise and fall of the ocean floor. Sitka Sound is presented in vivid detail. “To the west of that is state data and to the east of that is our user data. We’re getting pretty close on the shape of the bottom,” Rhoads added. Fishermen have long used soundings to visualize in their mind what the seafloor looks like and target species known to gather near certain topographical features. With these maps, Rhoads is able to home in on those locations more precisely. The fishermen in the room are more than the future users of this product. They were its data scientists too, pinging the seafloor with echo sounds for years while out fishing. At the end of every season, the Fishery Conservation Network (FCN) sent their data to the Alaska Longline Fishermen’s Association. Like pieces of a puzzle, ALFA reconciled the local data set with federal and state maps, working in concert with a software company called Nobletec TimeZero. Executive Director Linda Behnken said the result is one of the most complex bathymetric databases on the eastern side of the Gulf of Alaska. “140 million data points have been contributed. It’s been a lot of years getting to this point. We’re really excited about the level of detail we have now and the quality of the maps,” she said. ALFA is now ready to share these maps with the fishermen who helped make them. The .xyz file can be run on a $1000-value computer that supports the Nobletec software. Fishermen are invited to contribute to and clean-up the data set while out on the water. The goal of all of the bathymetry project is to make Sitka’s small boat fleet more competitive and efficient. Behnken said the project was born out of a desire to help the fleet target the fish they want and avoid the fish they don’t. “For example, halibut tend to be hard bottom areas rather than sandier, muddy bottom. But if you get into hard bottom with too many pinnacles, then you get too many rockfish,” she explained. In addition to reducing bycatch, Behnken hopes the maps will help fishermen avoid areas that host sensitive species, like corals and sponge, and protect their gear. Fishermen can start downloading the database on March 15th. The maps are available to all ALFA members in good standing at $600 or $250 with three year annual renewal. The Nobletec software costs $3000. All participating fishermen will sign user agreements pledging not to share the data outside of the network.